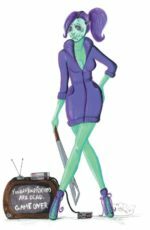 Take a stroll through a ghastly, gated pumpkin patch to get a glimpse of the lovely murderesses of the “Domestic Bliss” series: Claudia, Katia & Mathilda on Halloween night! 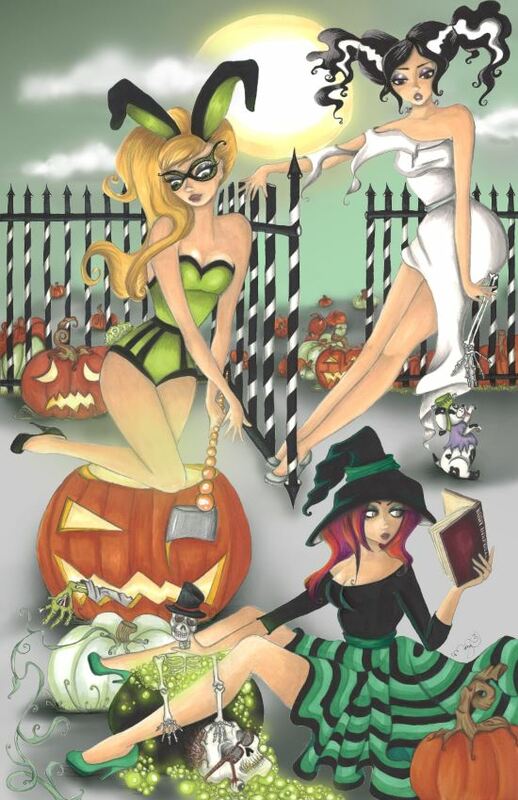 The 4th and newest installment of the “Domestic Bliss” series – This print of “A Domestic Bliss Hallows’ Eve” depicts all 3 ladies all decked out in their elegant Halloween costumes. Each lady has elements indicative of their style throughout the “Domestic Bliss” series. Claudia, dressed as a seductive bunny, carving a pumpkin with her lustrous ax; Katia as the Bride of Frankenstein, teasing her beloved dog, Andre (wearing a pint sized monster costume! ), with the arm of her long gone significant other, Ivan. And of course, Mathilda, dressed as a sorceress, boning up on her body disposal knowledge, as she brews up a deadly, bubbly brew – with the severed head of her husband by her side. 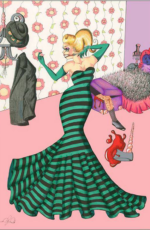 The “Domestic Bliss Collection”; fashion illustration inspired murder scenarios created by Dirty Teacup Designs. Each Domestic Bliss piece deals in tales of forced happiness through separation, a “can’t live with him can’t live without him” predicament, if you will. 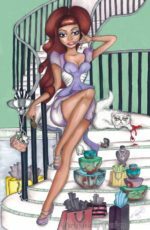 You can find the other installments of Dirty Teacup Designs’ “Domestic Bliss Collection” here. Illustration is printed on 11″×17″ or 5″×7″ high quality 12 pt. glossy cardstock paper. The original creation was made with technical pens, markers, and colored pencils on 11×17 Bristol paper. It was then scanned and adjusted slightly in Photoshop to produce a beautiful print.